Buyers Products SaltDogg 3.5-5 Cubic Yard Gas Conveyor Chain Spreader gives contractors and municipalities a gas-powered spreader ready for commercial use. The 96 in., 108 in., or 120 in. hoppers are designed for dump bodies and flatbeds with a minimum 15,000 lb GVW (gross vehicle weight) chassis. With electric start and in-cab throttle control, the spreader combines the power of a gas engine with modern spreader conveniences. Buyers Products sets the standard for what you should expect from your spreader company. The spreader comes equipped with a 12V electric clutch and in-cab, 3 position momentary switch and throttle. It comes outfitted with four hinged-top screens with 1/4 in. bars. The spreader's hopper and fully welded frame are made from high quality 304 stainless steel for long lasting corrosion protection. The hopper also comes outfitted with a top screen. Its 18 in. poly spinner casts material 2 ft to 30 ft. The spreader is available with a regular or extended chute. Two adjustable baffles allow you to cater the spread pattern to your use. The chute and spinner assembly flips up or detaches completely, tool-free, for convenient bulk unload, easy servicing, and access to towing. The spreader is built to get the job done. It's equipped with a steel pintle chain conveyor and features a stainless steel inverted V to reduce stress on the drive line and improve flow. The high-flow conveyor is 14-1/2 in. wide with 1/4 in. crossbars, and has a stainless steel floor. An adjustable feedgate with lock pin offers additional material flow control. The spreader is powered by a 10-1/2 HP Briggs and Stratton Intek industrial/commercial engine with an included battery for electric start. A heavy duty 1-1/4 in. drive shaft and 1-1/8 in. sealed bearings are designed for long life. The high-torque conveyor gearbox has a 20:1 ratio with a 1 in. input shaft and 1-1/8 in. output shaft on tapered roller bearings to provide extra power on startup. A SaltDogg Spreader is built to last. 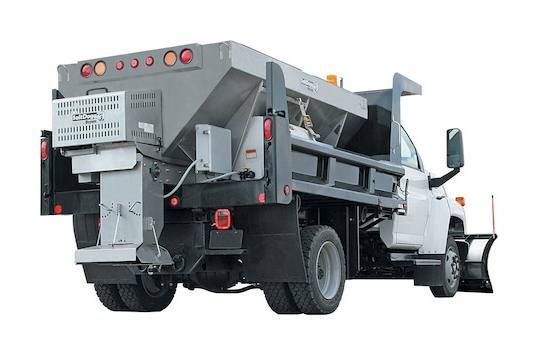 Designed for dump bodies and flatbeds with a minimum 13,000 lb GVW (gross vehicle weight). Powered by a 10-1/2 HP Briggs and Stratton Intek industrial/commercial engine with an included battery for electric start. Versatile 14-1/2 in. chain conveyor drive with 1/4 in. crossbars. Four hinged-top screens with 1/4 in. bars included.